Description: After the success of the first carry-and-play Little People playset, the #915 Play Family Farm, Fisher-Price followed the next year with the #952 Play Family House. Together, the two are the longest-running features in the Fisher-Price agenda and captivate new audiences today in cheaper, chunkier forms. Like the Farm, the house has a lot to offer for completists as color schemes for the furniture were changed roughly every two years leaving a neverending supply of variations. With no competition, the hot commodity from this set is the cardboard moving van, an ill-conceived and short-lived accessory that didn't prove to be as durable as the farm's silo. It was deleted from the Play Family House after only one year, making vans all but nearly impossible to find in any condition today. Surviving specimens in decent shape have sold for over $500.00 and collectors will readily scratch each other's eyes out to get their hands on one. After the 70's had passed and nobody in their right minds would dare to paint their house yellow and blue anymore, production on the original #952 ceased. In 1980, the revised Play Family House was unveiled with a more modern brown and white color scheme. The exterior lithos were redone, but--with minor alterations--the interior lithos remained basically the same. The accessories all followed over much the same as they left off, save the staircase, which was omitted. B952Y - Blue and yellow traditional 2-story house with a yellow plastic roof and a masonite (wood) base. 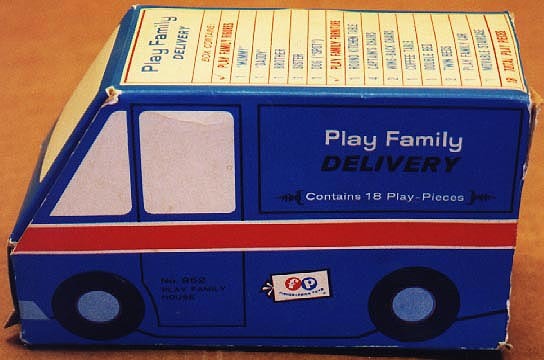 FP952VAN1969 - Blue cardboard moving van that holds all of the accessory pieces. FPT129 - White squared plastic double bed. The bed has a raised rounded headboard and a slightly raised rounded footboard. The bed has 4 short rectangular legs (one on each corner). The top of the bed was originally sold with DARK GREEN foam padding. The original foam padding tends to disintegrate over time. Size: 2-3/4" long x 2-9/16" wide x 3/4" tall. 2 each - FPT1571 - White rectangular single bed. The bed has a raised rounded headboard and a slightly raised rounded footboard. The bed has 4 short rectangular legs (one on each corner). The top of the bed was originally sold with DARK GREEN foam padding. The original foam padding tends to disintegrate over time. *See "Variations" below. 2 each - FPT171 - brown "stuffed" 1-seat armchair (formal style wing chair). FPT255 - Yellow 3-step staircase with a closet under the stairs. The closet has a door that opens and closes. The back side of the stairs has a litho of a yellow rain coat and a black unbrella hanging on a coat rack. BQWW - Dad - Green body with black heat-stamped hair. FNWW - Mom - Blue body, fancy eyes, and a blonde ponytail. CUWW - Boy - Orange body with red heat-stamped hair. FGWW - Girl - Blue body with blonde braids. HVWW - Black straight-sided dog with a yellow collar. The collar has "dots" on the outside edges. FPT127 - Yellow squared plastic double bed. The bed has a raised rounded headboard and a slightly raised rounded footboard. The bed has 4 short rectangular legs (one on each corner). The top of the bed was originally sold with DARK GREEN foam padding. The original foam padding tends to disintegrate over time. Size: 2-3/4" long, 2-9/16" wide, 3/4" tall. *See "Variations" below. 2 each - FPT1593 - Yellow rectangular single bed. The bed has a raised rounded headboard and a slightly raised rounded footboard. The bed has 4 short rectangular legs (one on each corner). The top of the bed was originally sold with DARK GREEN foam padding. The original foam padding tends to disintegrate over time. *See "Variations" below. 2 each - FPT178 - white "stuffed" 1-seat armchair. FPT196 - White small rectangular coffee/end table. FHWW - Girl - Blue body with red braids. HRWW - Black straight-sided dog with a white collar. The collar has "dots" on the outside edges. FPT895 - White top, red base garage style car. This car is marked "fp" and "Fisher-Price Toys" on the HOOD, it has a gas hole on the back corner, and it rolls on black 7/8" dia. wheels that are marked "Fisher-Price Toys". The wheels are held on via metal axles. No C-hook on back of car. *See "Variations" below. FPT314 - Medium brown squared plastic double bed. The bed has a raised rounded headboard and a slightly raised rounded footboard. The bed has 4 short rectangular legs (one on each corner). The top of the bed was originally sold with DARK GREEN foam padding. The original foam padding tends to disintegrate over time. Size: 2-3/4" long x 2-9/16" wide x 3/4" tall. *See "Variations" below. 2 each - FPT1484 - Medium brown rectangular single bed. The bed has a raised rounded headboard and a slightly raised rounded footboard. The bed has 4 short rectangular legs (one on each corner). The top of the bed was originally sold with DARK GREEN foam padding. The original foam padding tends to disintegrate over time. *See "Variations" below. FPT208 - Round white table with NO LITHO on the flat top surface. 4 each - FPT151 - Small white plastic single-seat captain chair that has a seat back that extends 3/4 of the way around the seat with a DOT mark on back. 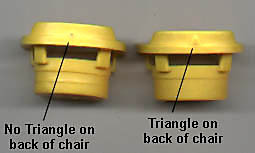 Click here to see the difference between triangle back verses dot back chairs. 2 each - FPT172 - Yellow (Gold/Butterscotch) "stuffed" 1-seat armchair. HUWW - Black straight-sided dog with a red collar. The collar has "dots" on the outside edges. FPT887 - Red top, white base garage style car. This car is marked "fp" and "Fisher-Price Toys" on the HOOD, it has a gas hole on the back corner, and it rolls on black 7/8" dia. wheels that are marked "Fisher-Price Toys". The wheels are held on via metal axles. No C-hook on back of car. 2 each - FPT171 - medium brown stuffed chairs. HVWW - Black straight-sided dog with a yellow collar. The collar has "dots" along the outside edges. 2 each - FPT1484 - Medium brown rectangular single bed. The bed has a raised rounded headboard and a slightly raised rounded footboard. The bed has 4 short rectangular legs (one on each corner). The top of the bed was originally sold with DARK GREEN foam padding. The original foam padding tends to disintegrate over time. *Note - The single beds usually match the color of the double bed. *See "Variations" below. 2 each - 2 each - FPT172 - Yellow (Gold/Butterscotch) "stuffed" 1-seat armchair. BQWW or BQWP - Dad - Green body with black heat-stamped hair. FNWW or FNWP - Mom - Blue body, fancy eyes, and a blonde ponytail. CUWW or CUWP - Boy - Orange body with red heat-stamped hair. FGWW or FGWP - Girl - Blue body with blonde braids. 4 each - FPT137 - Small medium brown plastic single-seat captain chair that has a seat back that extends 3/4 of the way around the seat with a TRIANGLE mark on back. Click here to see the difference between triangle back verses dot back chairs. Click here to see the difference between dark brown, light brown (rust), and medium brown. *See "Variations" below. FNPP - Mom - Blue body, fancy eyes, and a blonde ponytail. CUPP - Boy - Orange body with red heat-stamped hair. FFPP - Girl - Blue body with a brown sculpted bob. *New house design - B952B1 - Brown and white traditional 2-story house with a brown plastic roof and a masonite (wood) base. FPT639 - White top, green base 2-seat car with side-to-side seating. The car has a flat ribbed luggage rack behind the seats, a gas hole on the back corner, and is marked "FP" on the hood. The car rolls on 4 black wheels with metal axles. The wheels are NOT marked "Fisher-Price Toys". *See "Variations" below. FPT204 - Round lime green table with NO LITHO on the flat top surface. 4 each - FPT141 - Small lime green plastic single-seat captain chair that has a seat back that extends 3/4 of the way around the seat with a TRIANGLE mark on back. Click here to see the difference between triangle back verses dot back chairs. *Note - The color of the chairs usually match the color of the table. 2 each - FPT175 - Orange "stuffed" 1-seat armchair. B952B1 - Brown and white traditional 2-story house with a brown plastic roof and a masonite (wood) base. FPT127 - Yellow squared plastic double bed. The bed has a raised rounded headboard and a slightly raised rounded footboard. The bed has 4 short rectangular legs (one on each corner). The top of the bed was originally sold with PINK foam padding. The original foam padding tends to disintegrate over time. Size: 2-3/4" long, 2-9/16" wide, 3/4" tall. *See "Variations" below. 2 each - FPT1595 - Yellow rectangular single bed. The bed has a raised rounded headboard and a slightly raised rounded footboard. The bed has 4 short rectangular legs (one on each corner). The top of the bed was originally sold with PINK foam padding. The original foam padding tends to disintegrate over time. *See "Variations" below. FPT618 - White top, green base 2-seat car (front-to-back seats) with slightly raised "fins" on both sides of the back seat. The car has a gas hole on the back corner, and is marked "fp" and "Fisher-Price Toys®" on the hood and on the bottom of the car. The car rolls on 4 black smooth rolling wheels with metal axles. The wheels are marked "Fisher-Price Toys". *See "Variations" below. FPT121 - Lime green squared plastic double bed. The bed has a raised rounded headboard and a slightly raised rounded footboard. The bed has 4 short rectangular legs (one on each corner). The top of the bed was originally sold with WHITE foam padding. The original foam padding tends to disintegrate over time. Size: 2-3/4" long x 2-9/16" wide x 3/4" tall. *See "Variations" below. 2 each - FPT1538 - Lime green rectangular plastic single bed. The bed has a raised rounded headboard and a slightly raised rounded footboard. The bed has 4 short rectangular legs (one on each corner). The top of the bed was originally sold with WHITE foam padding. The original foam padding tends to disintegrate over time. *See "Variations" below. FPT205 - Round orange table with NO LITHO on the flat top surface. 4 each - FPT144 - Small orange plastic single-seat captain chair that has a seat back that extends 3/4 of the way around the seat with a TRIANGLE mark on back. Click here to see the difference between triangle back verses dot back chairs. *Note - The color of the chairs usually match the color of the table. FPT643 - Green top, white base 2-seat car with side-to-side seating. The car has a flat ribbed luggage rack behind the seats, a gas hole on the back corner, and is marked "FP" on the hood. The car rolls on 4 black wheels with metal axles. The wheels are NOT marked "Fisher-Price Toys". FPT123 - Orange squared plastic double bed. The bed has a raised rounded headboard and a slightly raised rounded footboard. The bed has 4 short rectangular legs (one on each corner). The top of the bed was originally sold with PINK foam padding. The original foam padding tends to disintegrate over time. Size: 2-3/4" long x 2-9/16" wide x 3/4" tall. See "Variations" below. 2 each - FPT1518 - Orange rectangular single bed. The bed has a raised rounded headboard and a slightly raised rounded footboard. The bed has 4 short rectangular legs (one on each corner). The top of the bed was originally sold with PINK foam padding. The original foam padding tends to disintegrate over time. *See "Variations" below. CJPP - Dad - Green body with black molded plastic hair. CYPP - Boy - Orange body with brown molded plastic hair. GEPP - Girl - Red body with a brown sculpted bob. B952B2 - Brown and white traditional 2-story house with a brown plastic roof and a green plastic base. FPT622 - Green top, green base 2-seat car (front-to-back seats) with slightly raised "fins" on both sides of the back seat. The car has a gas hole on the back corner, a tow hook hole under the front bumper, and is marked "Fisher-Price Toys" on the bottom of the car. The car rolls on 4 black smooth rolling wheels with metal axles. The wheels are marked "Fisher-Price Toys". *See "Variations" below. DHPP - Boy - Red body with brown molded plastic hair. 1969-1979 - B952Y - Yellow and blue house on a masonite base. 1980-1986 - B952B1 - Brown and white house on a masonite base. 1987-1988 - B952B2 - Brown and white house on a green plastic base. 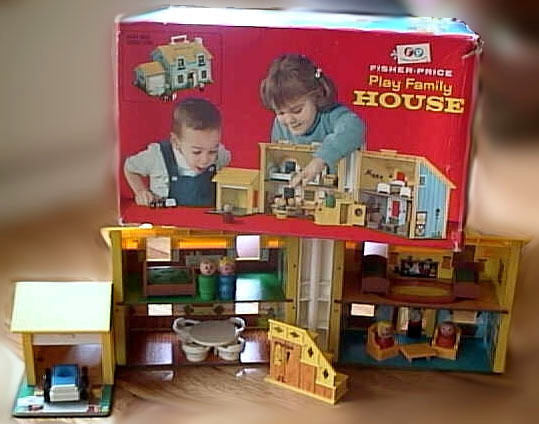 *Note: Although the masonite base was replaced with green plastic in 1987 in the USA, the house with a masonite base is pictured in the 1988 Fisher-Price Swedish dealers catalogue. 1969-1970 - FPT8457 - Blue top, white base garage style car. This car has a C-HOOK on the back and TWO metal rivets on the bottom. The car is marked "fp" and "Fisher-Price Toys" on the TRUNK lid, has NO gas hole, and rolls on black 7/8" dia. wheels that are marked "Fisher-Price Toys". The wheels are held on via white plastic axles. 1969-1970 - FPT8458 - Blue top, white base garage style car. This car has a C-HOOK on the back and TWO metal rivets on the bottom. The car is marked "fp" and "Fisher-Price Toys" on the TRUNK lid, has NO gas hole, and rolls on black 7/8" dia. wheels. The wheels are NOT marked "Fisher-Price Toys", and they are held on via white plastic axles. 1969-1970 - FPT8459 - Blue top, white base garage style car. This car has a C-HOOK on the back. The car is marked "fp" and "Fisher-Price Toys" on the TRUNK lid, has NO gas hole, and rolls on black 7/8" dia. wheels that are marked "Fisher-Price Toys". The wheels are held on via white plastic axles. No metal rivets on bottom of car. 1969-1970 - FPT8460 - Blue top, white base garage style car. This car has a C-HOOK on the back. The car is marked "fp" and "Fisher-Price Toys" on the TRUNK lid, has NO gas hole, and rolls on black 7/8" dia. wheels. The wheels are NOT marked "Fisher-Price Toys", and they are held on via white plastic axles. No metal rivets on bottom of car. 1969-1970 - FPT867 - Red top, white base garage style car. This car has a C-HOOK on the back and TWO metal rivets on the bottom. The car is marked "fp" and "Fisher-Price Toys" on the TRUNK lid, has NO gas hole, and rolls on black 7/8" dia. wheels that are marked "Fisher-Price Toys". The wheels are held on via white plastic axles. 1969-1970 - FPT868 - Red top, white base garage style car. This car has a C-HOOK on the back and TWO metal rivets on the bottom. The car is marked "fp" and "Fisher-Price Toys" on the TRUNK lid, has NO gas hole, and rolls on black 7/8" dia. wheels. The wheels are NOT marked "Fisher-Price Toys", and they are held on via white plastic axles. 1969-1970 - FPT869 - Red top, white base garage style car. This car has a C-HOOK on the back. The car is marked "fp" and "Fisher-Price Toys" on the TRUNK lid, has NO gas hole, and rolls on black 7/8" dia. wheels that are marked "Fisher-Price Toys". The wheels are held on via white plastic axles. No metal rivets on bottom of car. 1969-1970 - FPT870 - Red top, white base garage style car. This car has a C-HOOK on the back. The car is marked "fp" and "Fisher-Price Toys" on the TRUNK lid, has NO gas hole, and rolls on black 7/8" dia. wheels. The wheels are NOT marked "Fisher-Price Toys", and they are held on via white plastic axles. No metal rivets on bottom of car. 1969-1970 - FPT871 - White top, red base garage style car. This car has a C-HOOK on the back and TWO metal rivets on the bottom. The car is marked "fp" and "Fisher-Price Toys" on the TRUNK lid, has NO gas hole, and rolls on black 7/8" dia. wheels that are marked "Fisher-Price Toys". The wheels are held on via red plastic axles. 1969-1970 - FPT872 - White top, red base garage style car. This car has a C-HOOK on the back and TWO metal rivets on the bottom. The car is marked "fp" and "Fisher-Price Toys" on the TRUNK lid, has NO gas hole, and rolls on black 7/8" dia. wheels. The wheels are NOT marked "Fisher-Price Toys", and they are held on via red plastic axles. 1969-1970 - FPT873 - White top, red base garage style car. This car has a C-HOOK on the back. The car is marked "fp" and "Fisher-Price Toys" on the TRUNK lid, has NO gas hole, and rolls on black 7/8" dia. wheels that are marked "Fisher-Price Toys". The wheels are held on via red plastic axles. No metal rivets on bottom of car. 1969-1970 - FPT874 - White top, red base garage style car. This car has a C-HOOK on the back. The car is marked "fp" and "Fisher-Price Toys" on the TRUNK lid, has NO gas hole, and rolls on black 7/8" dia. wheels. The wheels are NOT marked "Fisher-Price Toys", and they are held on via white plastic axles. No metal rivets on bottom of car. 1971-1979 - FPT887 - Red top, white base garage style car. This car is marked "fp" and "Fisher-Price Toys" on the HOOD, it has a gas hole on the back corner, and it rolls on black 7/8" dia. wheels that are marked "Fisher-Price Toys". The wheels are held on via metal axles. No C-hook on back of car. 1971-1979 - FPT891 - White top, blue base garage style car. This car is marked "fp" and "Fisher-Price Toys" on the HOOD, it has a gas hole on the back corner, and it rolls on black 7/8" dia. wheels that are marked "Fisher-Price Toys". The wheels are held on via metal axles. No C-hook on back of car. 1971-1979 - FPT895 - White top, red base garage style car. This car is marked "fp" and "Fisher-Price Toys" on the HOOD, it has a gas hole on the back corner, and it rolls on black 7/8" dia. wheels that are marked "Fisher-Price Toys". The wheels are held on via metal axles. No C-hook on back of car. FPT619 - White top, green base 2-seat car (front-to-back seats) with slightly raised "fins" on both sides of the back seat. The car has a gas hole on the back corner, and is marked "fp" and "Fisher-Price Toys®" on the hood and on the bottom of the car. The car rolls on 4 black smooth rolling wheels with metal axles. The wheels are NOT marked. FPT883 - Blue top, white base garage style car. This car is marked "fp" and "Fisher-Price Toys" on the HOOD, it has a gas hole on the back corner, and it rolls on black 7/8" dia. wheels that are marked "Fisher-Price Toys". The wheels are held on via metal axles. No C-hook on back of car. *See "Variations" below. FPT620 - Green top, white base 2-seat car (front-to-back seats) with slightly raised "fins" on both sides of the back seat. The car has a gas hole on the back corner, and is marked "fp" and "Fisher-Price Toys®" on the hood and on the bottom of the car. . The car rolls on 4 black smooth rolling wheels with metal axles. The wheels are marked "Fisher-Price Toys". FPT621 - Green top, white base 2-seat car (front-to-back seats) with slightly raised "fins" on both sides of the back seat. The car has a gas hole on the back corner, and is marked "fp" and "Fisher-Price Toys®" on the hood and on the bottom of the car. The car rolls on 4 black smooth rolling wheels with metal axles. The wheels are NOT marked. FPT639 - White top, green base 2-seat car with side-to-side seating. The car has a flat ribbed luggage rack behind the seats, a gas hole on the back corner, and is marked "FP" on the hood. The car rolls on 4 black wheels with metal axles. The wheels are NOT marked "Fisher-Price Toys". Furniture Variations - Both the brown and the yellow furniture that was sold in this set were available in one of three different shades: light brown (rust), medium brown, and dark brown, yellow, mustard yellow, and gold/butterscotch yellow. Click here to see the differences between the browns and click here to see the differences between the yellows. FPT119 - White single bed MISSING FOAM PADDING. FPT106 - Gold/Butterscotch yellow single bed MISSING FOAM PADDING. FPT107 - Mustard yellow single bed MISSING FOAM PADDING. FPT115 - Yellow single bed MISSING FOAM PADDING. FPT8476 - Small light brown (rust) plastic single-seat captain chair that has a DOT mark on back. FPT138 - Small medium brown plastic single-seat captain chair that has a DOT mark on back. FPT317 - Small dark brown plastic single-seat captain chair that has a DOT mark on back. FPT141 - Small lime green plastic single-seat captain chair that has a TRIANGLE mark on back. FPT142 - Small lime green plastic single-seat captain chair that has a DOT mark on back. FPT143 - Small orange plastic single-seat captain chair that has DOT mark on back. FPT152 - Small white plastic single-seat captain chair that has TRIANGLE mark on back. FPT151 - Small white plastic single-seat captain chair that has DOT mark on back. FPT171 - brown "stuffed" 1-seat armchair. FPT174 - lime green "stuffed" 1-seat armchair. FPT175 - orange "stuffed" 1-seat armchair. FPT178 - white "stuffed" 1-seat armchair. FPT172 - Yellow (Gold/Butterscotch) "stuffed" 1-seat armchair. FPT193 - Lime Green small rectangular coffee/end table. FPT194 - Yellow (Mustard) small rectangular coffee/end table. 1969-1979 - This set was sold in a 15-1/4" long, 8-3/4" high, 9-1/2" deep box. The box has a picture of a blue and yellow house with a masonite base. 1980-1982 - This set was sold in a 15-1/4" long, 8-3/4" high, 9-1/2" deep box. The box has a picture of a brown and white house with a masonite base. 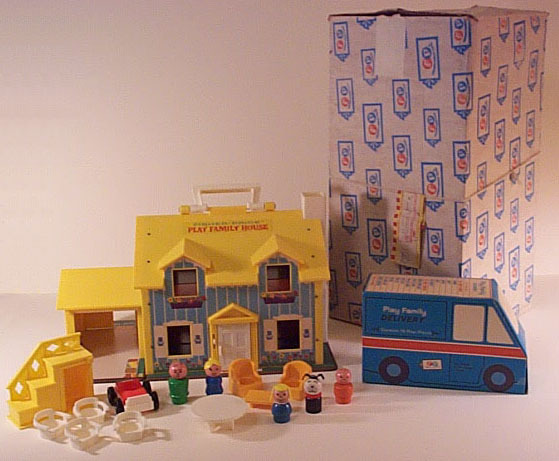 1983-1985 - This set was sold in a 16" long, 9-5/8" high, 9-1/2" deep box. The box has a picture of a brown and white house with a masonite base. 1986 - This set was sold in a 16" long, 13-7/8" high, 7-5/8" deep box. The box has a picture of a brown and white house with a masonite base. 1987-1988 - This set was sold in a 15-1/2" long, 13-5/8" high, 9" deep box. The box has a picture of a brown and white house with a green plastic base. Retail price in the 1971 J.C. Penneys Spring and Summer Catalogue was $9.88.